Make your evening magical! 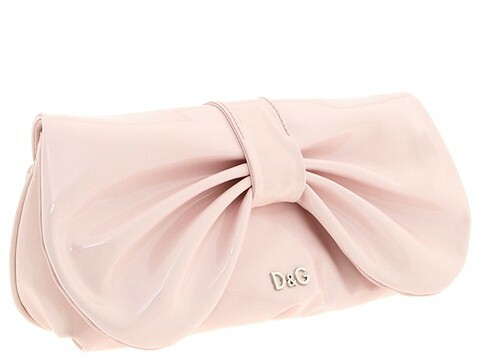 Glamor is guaranteed with this enchanting bag by DG Dolce and Gabbana™! Clutch style handbag made of gorgeous glossy patent leather. Holds your wallet, keys, a pack of gum, and a slim cell phone. Dimensions: 9 1/2 wide across bottom, 10 3/4 wide across center, 9 3/4 wide across top x 2 1/2 deep x 5 high. Single shoulder chain. Shoulder drop: 21 length. DG ornamentation. Platform bottom. 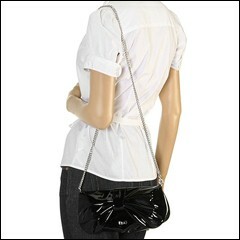 Beautiful bow shaped top flap with a magnetic snap closure. Vibrant interior lining with a multifunctional slip pocket. 13.00 oz.